School attendance in the CZ is compulsory from the age of 6 to 15. Most children go to state schools, but there are also established private and church schools. Education at state schools up to 18 is free of charge,but students at secondary schools must pay for their textbooks. Children don’t wear uniforms. The school year starts on 1th of September and ends on 30th of June of the following year. The school year is divided into 2 terms. The average number of lessons at a secondary school is about 30 a week. Classes begin at 8 a.m. and there are from 4 to 7 lessons in a row, followed by a lunch break and then afternoon classes sometimes. Afternoon classes end between 4 and 5 at the latest. Breaks between the lessons are from 5 to 20 minutes. Pupils and students are evaluated by marks from 1 to 5. Education in our country includes these stages: pre-school, primary, secondary and tertiary school. Pre-school education is provided by creches for children up to 3 years and kindergartens for children from 3 to 6. At 6 children start to go to primary schools and they stay there until 15. Then they transfer to secondary school. Some pupils transfer to grammar school at the age of 11 after they have passed an entrance examination. Secondary education lasts for 4 years. Grammar and specialized schools are finished with a school-leaving examination which is required for all universities and colleges. 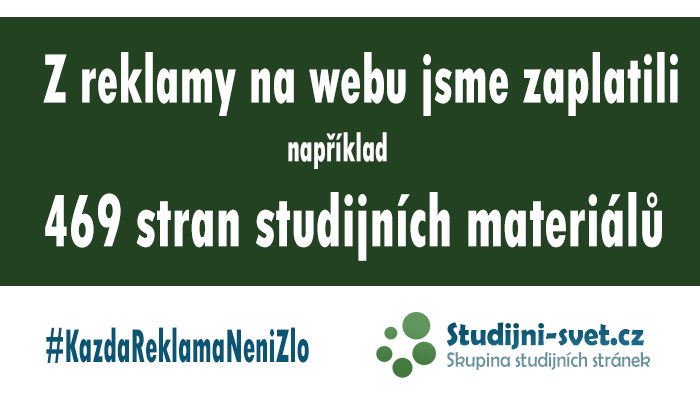 This examination is taken in 4 subjects at grammar schools /Czech, a foreign language/Maths and 2 optional subjects: foreign languages, science subjects or humanities. It is held in May and is mostly oral except Czech in which an essay is written about a month before. After the graduates have passed their school-leaving exam they receive the School-Leaving Certificate and they can apply for study at universities and colleges.Graduates are accepted, when they passed an entrance examination. Our oldest university is Charles University in Prague, founded by Charles IV in 1348. Other universities are Masaryk´s University in Brno, Palacký University in Olomouc and Purkyně University in Ústí nad Labem. Undergraduates can study economics, foreign trade, architecture, law, journalism, the humanities, foreign languages, medicine, science, music, art, drama, engineering or computer science at School of Economics or Architecture, Law, Medical or Science Faculty, Faculty of Journalism, Arts, Teacher’s Training College, Art School, College of Agriculture, technical universities or polytechnics. Universities and colleges provide tertiary education which lasts from 4-6 years. The students can enroll at 3-year courses for Bachelor’s Degree or four and five-year courses for a Master’s Degree. Medicine takes 6 years. It is finished with a state examination and every undergraduate also has to write work a thesis in order to receive a diploma. The diploma is handed over at a graduation ceremony. 3 and 4 year-old children receive nursery education in kindergartens. The children learn basic skills (how to draw, paint, sing, communicate, playing games, basic hygiene). All children and young people between the ages of 5 and 16 must get full-time education. State schools work from Monday to Friday from 9 am to 3 or 4 pm. Primary schools-for ages of 5 to 11, divided into infant school /5-7/ and junior school /7-11/ In Infant School the children learn to read and write and the basics of arithmetic. In Junior School they study history, geography, mathematics, science, English and, in some schools, also a foreign language. Physical Education is usually given twice a week. Secondary schools /comprehensive school, grammar school/ – isfor ages over 11. Subjects taught at schools are given by the national curriculum: English, Mathematics, Science, Technology, History, Geography, Music, Art, PE, foreign language /at age 11-16/ and optional religious education or technical and vocational education. Children have to take test at the age of 7,11,14, but when they are 16 years old, they have to passed the General Certificate of Secondary Education (GCSE). When the students want study at university, they have to pass the Advanced Level of GCSE at the age of 18. They can pass this exam only from 3 subjects. Those who do not want to study at universities can be trained in nursing, law, banking, accountancy or in manufacturing or service industry. About 7% of British children attend independent or private schools. Some of these are boarding schools,which means that the pupils live there and only go home for holidays. Independent schools are very expensive, but the government provides funds for very clever children from poorer families if their parents wish to send them to a private school. Public/other independent schools from 13 to 18. The pupils must pass a special exam (Common Entrance Exam) to attend these very exclusive schools. The most famous public schools are Eton (founded in 1440) – Prince Charles´s son William and Harry studied at Eton, Harrow (1571) and Rugby (1567). university is not easy; it is very competitive and the results of the GCE A-level exams are very important. A student can apply to up to five different universities. Almost 90% of students get a degree. 3. the new universities opened after 1960-Sussex, York, Kent? The basic qualification for university admission is the GCSE at A level. The courses last usually over 3 to 4 years /5 or 6 in medicine, dentistry and veterinary sciences/. The first degree is either BA or BSc /put after one’s name/. The following degree is MA or MSc /students must work on a thesis at least for one year/. PhD (Doctor of Philosophy) granted to students after three years of research work. This is for those who wish to become academics or teach in a university. Founded in 1969 to provide opportunities for working-class students who had left school at the age of 16 and, as adults, wanted to improve their education, it has become very popular. It provides degrees for adults of all ages and no special qualifications are required. Students study at home through special television programs, audio and videocassettes, correspondence tuition and summer schools. Students usually choose universities that are not near their homes. They can either live on the campus or rent flats with other in the town. Life is very intensive and students do not usually have time for a job, but they are given a financial grant, which helps to pay fees and maintenance. If the grant is not sufficient they can receive a loan from the government which they must pay back when they start earning money. If students do not complete their course in time they must leave without a degree. In the U.S.A. there is not a national system of education. All states require young people to attend the school. The age limits are 7 to 16, 6 to 18. Every child gets minimum 13 years of education. Elementary school-The pupils learn mathematics, language arts /reading, grammar, composition/, science, history, geography, music, PE, computer courses and second language teaching. Secondary school /high school/ -usually divided into junior /at 11 to14/ and senior high school. They get a high school diploma. Most schools offer English, Mathematics, science, social studies and PE along with foreign language.